Announced earlier in the year the Nikon AF-S DX Nikkor 18-300mm f3.5-6.3 G ED VR is a new lightweight and more accessibly priced version of the earlier DX 18-300mm f3.5-5.6 ED VR. With AF sensor capability unaffected by the slight reduction in maximum aperture from f5.6 to f6.3 substantial weight savings have been achieved. As a result it’s not a replacement but like its forerunner this DX format model, with the equivalent field of view to that of a truly expansive 27-450mm, it is stabilized and adopts a sonic type motor for fast and near silent operation. It differs however by adopting less complicated 16-element, 12-group design with 7-aperture blades, as opposed to the 19 element, 14 group construction and 9-aperture blades of the pricier model. However both models similarly use three ED glass elements and three aspheres for correction of a broad range of aberrations. The simplified design means the lens is relatively compact at 3.09 x 3.90″ (78.5 x 99 mm) against the 3.3 x 4.7″ (83.8 x 119.4 mm) of the earlier model and at 19.40 oz (550g) versus 1.83 lb (830g) it’s almost a 1/3rd of the weight. The newer model also has a smaller 67mm filter thread as opposed to pro-standard 77mm filter thread of the original. 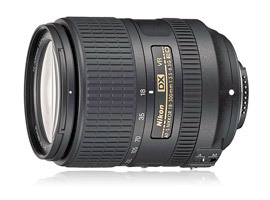 The lens is available for $899, some $100 less than the current DX 18-300mm f3.5-5.6 ED VR version. With rivals such as Tamron and Sigma (not reviewed) introducing small light and affordable models it was perhaps inevitable that Nikon would update their older model (and still a relatively new model at that). Although losing a 1/3rd of stop when zoomed out, with a significant reduction in weight and a 4-stop stabilizer (as opposed to 3.5 stop) it has some tangible benefits over the older optic. However while Nikon managed to improve the image quality across much of the zoom range is commendable the inclusion of some CA at 300mm will be a concern to some. So too will be the price. While Nikon shaved a $100 off the f3.5-5.6 version it’s still around twice that of rivals. 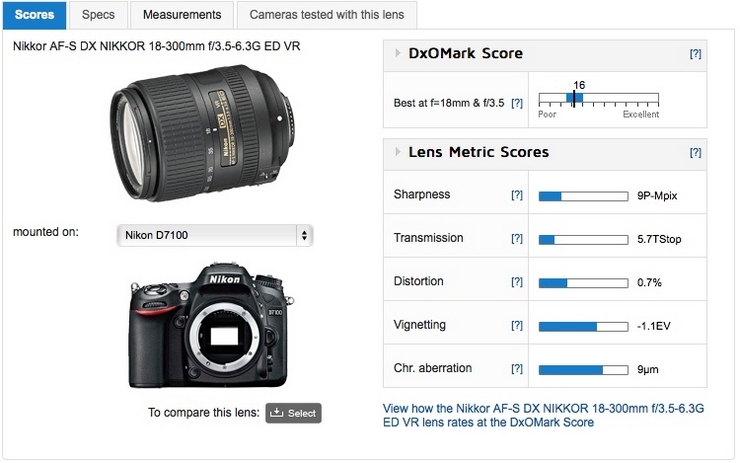 With a DxOMark lens score of 16 points the Nikon AF-S DX Nikkor 18-300mm f3.5-6.3 G ED VR performs slightly below most zooms but then that’s to be expected from a model with an incredible 16.7x zoom range. Peak sharpness of 9P-Mpix is very good from the 24-Mpix sensor of the D7100. If there’s a flipside to this it’s that distortion is quite high (with barreling noticeable at the shorter end and pincushion when zoomed out) and there’s some CA noticeable at 300mm in the corners at the initial aperture (f6.3), but transmission (measured at T4-7.1)and vignetting are excellent for a lens like this.